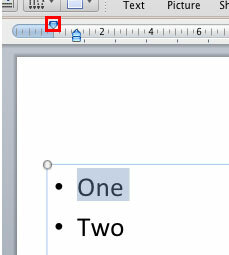 Although this is not so obvious, the position of the bullets or numbers in a list is influenced by indent markers you see on the Horizontal Ruler within PowerPoint. There are three types of Indent Markers -- the First Line Indent Marker, the Hanging Indent Marker, and the Left Indent Marker. In this tutorial, we will explore how the First Line Indent Marker (shown highlighted in red within Figure 1, below) influences the position of the bullets (or numbers). First Line Indent Marker determines the left most edge of the bullet character itself. If you drag the First Line Indent Marker along the Horizontal Ruler, the bullets associated with the selected text also move accordingly. Select the bulleted paragraph or paragraphs that you wish to tweak. In Figure 1, above -- you can see the first bulleted paragraph has been selected. Note: If you want to change the position of a particular bulleted paragraph, then select only that individual bulleted paragraph. If you want the change to effect all bulleted paragraphs in the placeholder (or text box), select all the paragraphs. Tip: Pressing the Command key while you drag the Indent Marker will give you more control over the placement. Upon dragging the First Indent Marker to the new position, you will find that the bullet character associated with the selected paragraph has moved rightwards (see Figure 3). Compare it with the bulleted paragraphs that were not selected. As you can see, the space between the bullet character and the paragraph following it has been decreased, and also the space between the bullet and the left edge of the text placeholder has increased. However, the start position of the paragraph following the selected bullet character (of the first bulleted paragraph) has not changed -- it's on the same position as the second paragraph that was not tweaked. This results in a different paragraph placement, as shown in Figure 6. As you can notice in Figure 6 above, the actual position of the bullet character cannot move beyond the Hanging Indent Marker position. Instead, the paragraph itself has now moved to the new position of the First Line Indent Marker! Moving the First Line Indent Marker leftwards until the position of the Hanging Indent Marker will show the effect on the bullet position. Thus, although you can actually drag the First Line Indent Marker rightwards as much as you want, this only influences the paragraph, and you cannot move the bullet any more rightwards beyond the position of the Hanging Indent Marker (Hanging Indent Marker). If your selected bulleted paragraph is in a lower hierarchy (Bullet Level 2 or lower), as shown in Figure 7 below -- then you can also drag the First Line Indent Marker towards left. Refer to Figure 7 again. Leave the First Line Indent Marker in a new position where you want to move the selected bullet character. This moves only the selected bullet towards left, not the paragraph following it, as shown in Figure 8. Compare the positions of the selected bullet characters in Figures 7 and 8. Note: Instead of changing position of bulleted paragraphs on each and every slide in the presentation, you can access the Slide Master view and make changes there. This way you will be making changes just once and every slide will be effected.